Il TLM 193 è un microfono a diagramma grande con un figura polare cardioide. Con questo microfono, Neumann continua la sua lunga tradizione, e offre un'alta tecnologia a un prezzo ragionevole per i musicisti e studio home recording. Il microfono usa un circuito senza trasformatori, con un rumore di fondo estremamente basso e una vasta gamma dinamica. La risposta polare è molto lineare e ha un grande angolo di incidenza. In questo modo, anche i segnali provenienti ai lati sono riprodotti fedelmente senza colorazione. La superficie esposta della capsula del microfono è immune alle interferenze e contaminazioni. Il microfono viene fornito con uno snodo per asta. Il TLM 193 è un microfono con caratteristica cardioide per registrazioni professionali e applicazioni live. E' il microfono ideale per produzioni professionali, per musicisti e project studios. The TLM 193 is addressed from the front, marked with the Neumann logo. The large diaphragm capsule inside the headgrille has a very smooth frequency response for all polar patterns over a wide acceptance angle. The curves are flat and parallel to the 0° frequency curve up to 10 kHz within a pickup angle of ± 100°. The TLM 193 differs from omnidirectional pressure transducers, where, due to physical reasons, the diffuse-field and free-field responses never agree. This microphone has a very even diffuse-field response for all polar patterns. This is important in a reverberant environment, as more reflections arrive at the microphone from different directions. 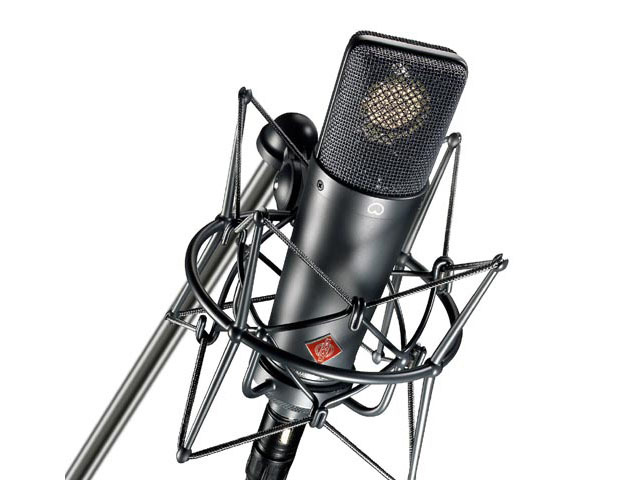 The acoustic information is not affected in its tonal quality when recorded by the microphone. This characteristic is achieved without resorting to corrective resonance effects. Therefore, the microphone maintains an excellent impulse response reproducing all transient phenomena of music and speech without coloration. The letters TLM stand for "transformerless microphone". With TLM technology the usual output transformer is replaced by an electronic circuit. As with traditional transformers, it ensures good common mode rejection, and prevents RF interference, that may influence the balanced audio signal. Compared to other microphones the self noise level of the TLM 193 is considerably reduced. As it is capable of handling sound pressure levels up to 140 dB without distortion, the TLM 193 provides a dynamic range of 130 dB (A-weighted). The capsule is elastically mounted to avoid any structure borne noise that could interfere with its operation. The frequency response of the TLM 193 amplifier is linear down to 20 Hz. Even very low bass signals are reproduced without coloration. This implies that the microphone becomes more sensitive to subsonic frequencies, from structure borne noise or pop and wind noise. To avoid any LF interference, we recommend to use the EA 1 elastic suspension, the PS 15 pop screen, or the WS 89 windscreen.